There's a lot of strange things in the land of Middle-Earth: Giant monstrous Spiders, elven-crafted rings of power, short people with big feet and a penchant for lounging around, you get the picture. What you absolutely will not find, however, are... Pumpkins? Tolkien's estate is apparently very, very serious when it comes to Gourds. 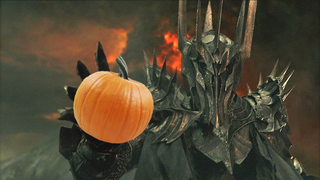 The estate argues that, as Tolkien based his fantasy world heavily on Ancient Europe, a New World crop like the Pumpkin wouldn't exist there, and thus was absolutely banned from showing up in products that licensed Lord of the Rings and The Hobbit directly from Tolkien Enterprises. The movies, and products based on that license, could essentially do what they damn well pleased - which included the presence of tomatoes in Middle-Earth, another food item barred by the Estate. There's plenty enough in Peter Jackson's movies that probably sends Tolkien Enterprises into fits of apoplectic rage that Denethor uncomfortably nibbling on a few cherry tomatoes in Return of The King was probably the least of their concerns. So there you have it. In Middle-Earth, not all those who wander are lost - unless they happen to be looking for a Pumpkin Spice Latte.